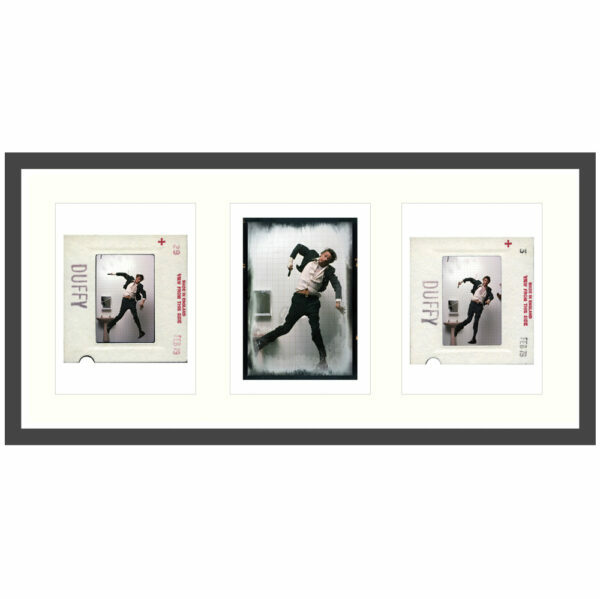 This image was Duffy’s take on the Lodger scene which was originally intended for the album cover. Shooting from the rafters of his London studio, Duffy photographed David who was suspended on a custom built metal frame. Bowie’s face was then manipulated by fishing line to enhance the look of the falling man. Until this imagery was published in the Five Sessions Book it was never released. The clarity and warmth of the Kodachrome outtakes show all the minor details of the intricate scene that Duffy created. However, at the last minute, David decided to use a cropped version of Duffy’s test Polaroid for the album cover instead. Duffy’s Experimental sink and one of the Lodger Set images were also included in the album’s gatefold. David’s bandaged hand was actually the result of a coffee burn, though perfectly suited the dramatic imagery adding another element to Duffy’s scene. We have now extended our range of frames to include black, white and charcoal grey.